With a couple of days left of 2011, Jeffreys Bay pulled out the most incredible holiday weather with prevailing calms seas, low winds and warm water. African Waters Scuba has been doing so many launches, that we struggle to keep track of it all. (We do have the indemnity forms and dive register for each dive so can check it if we need to!) The viz has been absolutaly incredible several days in a row. Another perfect dive was done on Rock Cod reef on Saturday morning. It was spring tide and the sea was a little choppy with some looming cloud cover, but we were greeted with a total opposite scenario once the dive started. A nice sized leopard cat shark was spotted as well as a shy shark and a large ray. Wednesday 21 Dec 2011 we decided to do a shore entry at Paradys Strand. The tide was still going out and after the strong easterly viz was reduced to about 1m. After making their way safely through the surf the divers were all exited about the dive but were not so impressed after the swim out to the reef. 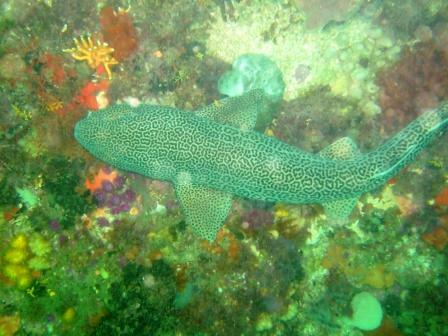 On Thursday we went a bit further out to sea and dived Rock Cod Reef. Water temp on the reef was 19 deg and we had about 8m viz. Some Ray's were spotted and there was talk of some raggies being sited as well. The anemone seem to be active again and feeding on the coral. On Tuesday 20 Dec 2011 we dived at Jagged Edge Reef. A bunch of new faces on the boat as almost every day. A big flat worm was spotted and once again every one was impressed with our unspoilt reefs.